The MSA 3S full face mask, the most successful mask design in the world with over 5 millions units sold, has been upgraded. It offers even more user comfort and value, without changing the 3S Classic style! A softer face seal, enlarged harness attachment areas, a deeper chin cup combined with the proven classic design, the MSA 3S improves its efficiency whilst remaining one of the users favourite full face masks. [1. The Face Blank] is made of a special rubber compound, softer and more comfortable than ever. It is not affected by creams or lotions. The wide sealing frame and a deeper chin stop assure a snug, comfortable fit and a tight seal. The 3S face blank is also available in yellow silicone [these versions are not affected by the upgrade], which does not irritate the skin and is particularly resistant to ageing. Some versions of the MSA 3S are also available in small size. [2. The Lens] moulded from impact resistant plastic [polycarbonate], is securely sandwiched between a groove in the face blank with a 2-part plastic lens ring. The large field of vision is another safety feature of the mask. Some lenses are also available in silicate coated glass [V] or Triplex glass [Vg]. [3. The Connector] is clamped into the face blank. It contains the threaded connection or the plug connection, the inhalation valve and the speech diaphragm. The speech diaphragm permits excellent communication. [4. 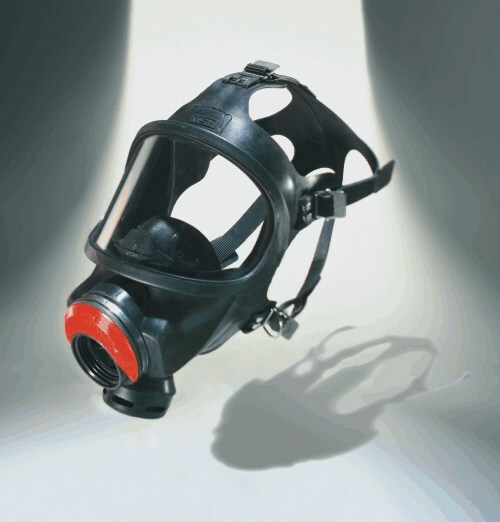 The Exhalation Valve] is located in the lowest point of the face mask. Its large cross section results in a low exhalation resistance. Valve disc and valve cover are easily replaceable. [5. The Harness] enables quick donning and removal of the face mask without prior adjustment. A pressure-free fit is achieved also in combination with a protective helmet. With the carrying strap, the 3S can be carried in front of the chest, ready for use. Now, with the enlarged tabs of the f ace blank, the MSA 3S harness is even easier to don. [6. The Inner Mask] provides an optimal air flow and keeps the lens free from fogging. It reduces the dead space effectively. The rolled edge cares for a soft and comfortable contact with the face.